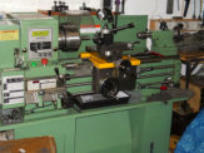 This lathe has been the mainstay of the workshop for over 40 years. I bought it from new in 1969. Although it has been modified to incorporate new features the bearings are original, as are most parts. Features added: Gearbox; Alternative clutch arrangement; Quick release and auto release of screw cutting engagement; rear tool post; four way tool post (George Thomas design); Rear drop-on tool post (dovetail mount); Rear table mount for long taper turning gear. I decided to buy a new lathe to accompany the Myford and hopefully provide the ability to machine larger size materials. 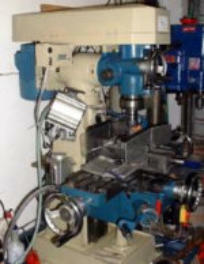 The lathe is a Warco BH600G which is basically of the same format as the Myford complete with a herring-bone back gear. The lathe is substantially bigger in mass when compared with the ML7 but not much bigger in footprint. Since the lathe has been installed it has proved it is both accurate and powerful. Several new additions have been added to the lathe to improve working and reducing gear train noise . Originally I made a Dore Westbury (Mk 1) but found it too limiting on table space. I replaced this with an Eastern mill-drill import which I modified but have now have upgraded once more. This new machine is a better engineered mill when compared to the Mill/Drill and has the added advantage of a variable speed inverter and DRO. (recently the DRO failed and has since been replaced with a Sino unit). The 626 came fitted with a speed inverter and 3 phase motor. The speed inverter has immediately proved to be a big success and in conjunction with a selection of belt drives I can now obtain a wide range of speeds and still retain full torque. 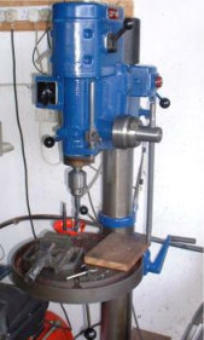 This machine is a first class industrial drill with the name Gima and I think supplied or made by Bergman Borr, Sweden. I came by this drill as it was left abandoned because it had some missing gears. After a short discussion I left with the drill in pieces and later found a kind gear maker who generously made the new gears for me at a low price - I think he knew I was a hard up and said as I had gone to the trouble of working out the gear size etc. he was pleased to help me. The machine has an integral 3 phase motor built in and so I use a makeshift converter and a slave 3phase motor. A superb drill and a major asset! I think the drilling machine is one of the most important machines in a workshop. This is a prototype gear involute profiling machine based on the Sunderland Gear Planing machine. This has been a major project lasting several years as I designed the complete machine working only from first principles used in the Sunderland. The machine is small and has a footprint to fit a bench top and by virtue of its relatively small dimensions it had to have design features to compensate for a lack of mass. The machine will cut and profile accurate involute curved teeth for spur gears with a design maximum gear size of 20DP or 1.25Mod. The involute curve generated is accurate to the precise number of teeth in the gear and not an approximation. The machine once set up performs the machining task automatically and require no operator input other than to stop the machine or make setting adjustments should multiple cutting passes be necessary.